Redevelopment of old industrial sites gives the opportunity for councils to require dedications of land, in this case creating an important pedestrian corridor connecting existing parks and linking to the foreshore walk, and also opening up views that previously did not exist. The carting firm founded by John Meloy occupied the land between Avon Street and Palmerston Avenue for a hundred years, first using drays drawn by draught horses, and later using lorries, much to the consternation of surrounding residents. There were a number of carting firms operating in Glebe, all in residential areas, because of the proximity of Sydney Markets. There was no separate zoning for businesses in the nineteenth century, although there was a tendency for them to congregate on major roads, and we will visit one such group later on this walk. 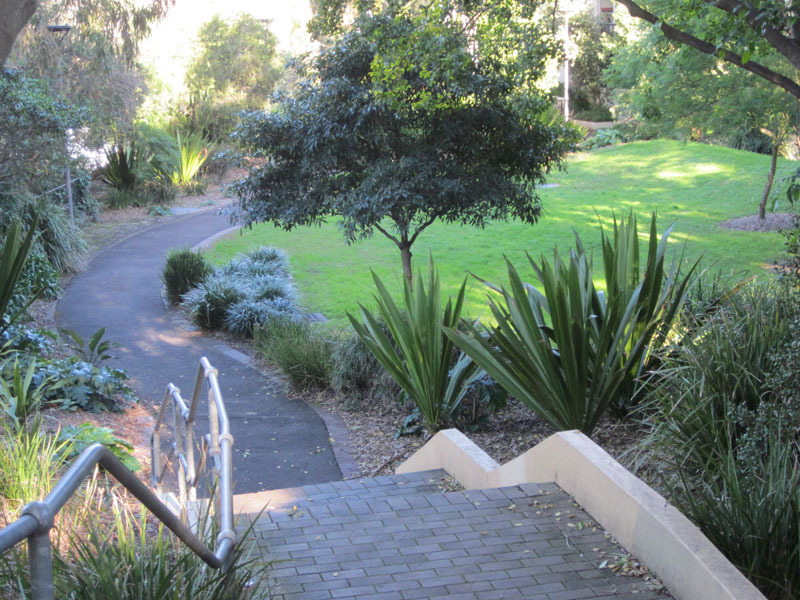 When the Meloy site was redeveloped as housing in 2002 the Council required dedication of the land at the top of the cliff for open space and a walkway to access waterfront parklands, not then complete, from Glebe Point Road, and also to open views along the Light Rail corridor to Wentworth Park and the head of Blackwattle Bay. The land below the fence is partly owned by Council and partly by the State Rail Authority, which built the former goods line, now hosting Light Rail, during World War I. Council has removed most of the weedy growth from this area, and we hope will plant more suitable species. William (Bill) Carlton succeeded Tom Keegan as MLA for Glebe in 1935.